On Thursday 1 February, farmers from across Cumbria and North Lancashire took part in the Westmorland Agricultural Society’s (WAS) Silage Competition. 2018 has seen 97 entries from 62 farms which is an all-time record confirming this important competition is widening its appeal and growing in popularity. 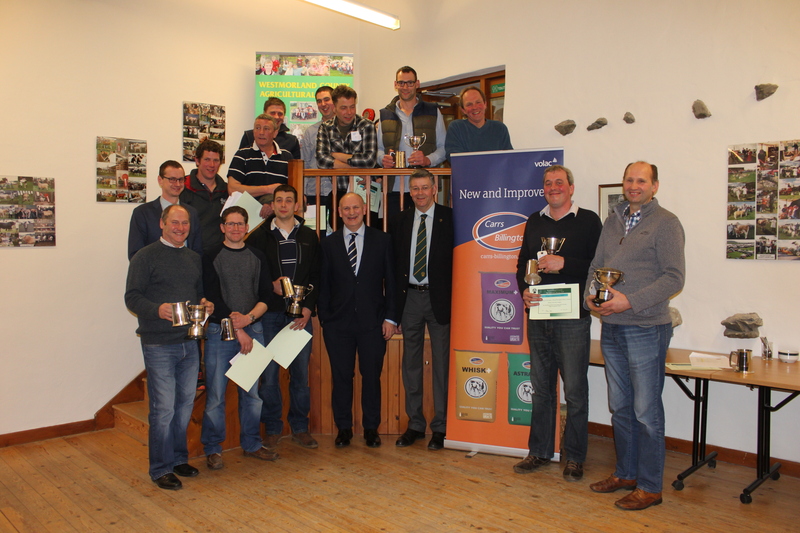 Held annually in February, the competition is split into six categories including dairy clamp, beef clamp, hay, whole crop, maize and big bale and is judged in two sections, one for analytical/nutrient content and the other on a visual assessment. This years’ event was sponsored for the first time by Carrs Billington Agriculture (CBA), who are the suppliers of products and services to the farming and rural community. Following nutritional analysis by CBA, 24 entries were shortlisted for visual judging where an inspection of the silage was carried out on site at each shortlisted farm. Mr John Long judged Dairy and Whole Crop, Mr David Loftus judged Maize and Hay whilst Mr Andrew Bellas judged Beef and Big Bale. The results were announced at a special celebratory dinner held on Thursday 1 February in the evening at Lane Farm with presentations made to all the winners by John Geldard, President of the Westmorland Agricultural Society.